Orland Park, IL – The 4th Annual Illinois Sepsis Challenge 5K Fun Run and Walk, presented by Presence Health, at Centennial Park recruited over 225 participants and raised over $50,000 to benefit Sepsis Alliance, the nation’s leading nonprofit patient advocacy organization promoting awareness of sepsis. Just over half of Americans have heard of the nation’s third leading cause of death – sepsis. The fun 5K run/walk aimed to change that by raising awareness for this treatable and preventable condition. Sepsis is the body’s overwhelming and life-threating response to infection, which can lead to tissue damage, organ failure and death. Because sepsis can not only be treated, but prevented, thousands of lives can be saved each year by simply raising awareness of its symptoms. This year’s event honored Ethan, Theresa and Cole Sappington. 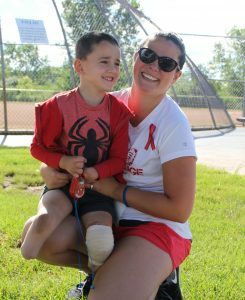 Ethan is a sepsis survivor who endured multiple amputations and is an inspiration to others. Sepsis Alliance is the nation’s leading sepsis advocacy organization, dedicated to saving lives by raising awareness of sepsis as a medical emergency. A 501(c)(3) organization, Sepsis Alliance was founded by Dr. Carl Flatley after the sudden, unnecessary death of his daughter Erin to a disease he had never even heard of. Sepsis Alliance produces and distributes educational materials for patients, families and health providers on sepsis prevention, early recognition and treatment. The organization also offers support to patients, sepsis survivors, and family members through its sepsis.org website which receives more than 1.5 million visits each year. The organization founded Sepsis Awareness Month in 2011, and works with partners to host community outreach events across North America. Since Sepsis Alliance began its mission, sepsis awareness has increased almost threefold, from 19% to 55%. For more information on Sepsis Alliance, a GuideStar Gold-rated charity, please visit https://www.sepsis.org/.